The moon Ganymede is seventh out from the planet Jupiter and the third out of the four Galilean satellites. With a diameter of 3,273 miles, it is the largest moon in the solar system, being even slightly bigger than the planet Mercury. It lies at just over 665,000 miles out from its host planet, which it orbits in around seven days. The moon is the only one known to possess a magnetosphere, a feature usually reserved only for planets. A glance at the image above shows white splashes all over the surface, plus some contrasting light and dark areas. Out of these two areas, although both are extremely ancient, the light areas are a little younger. The white splashes are the rays from impact craters. For some reason, there are far more craters in the dark areas. There is also a marked contrast in terrain between the light and dark areas. As you can see, the lighter terrain seems much more ordered. There has been much speculation as to why this is, but, as yet, the actual cause for it is unknown. 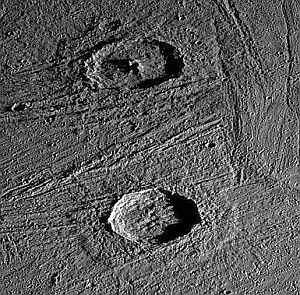 A study of the craters on the moon Ganymede indicate that it suffered very heavy bombardment around four million years ago, at around the same time as our Moon. 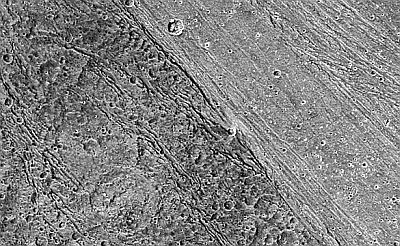 Ganymedian craters, however, tend to be a lot flatter than the Moon's, probably due to Ganymede's icy crust being softer and more yielding. Some craters have disappeared entirely, leaving a sort of "ghost" of themselves and these are termed "palimpsests". The moon also possesses polar ice caps. These are thought to have been formed by bombardment of the surface ice by cosmic rays. 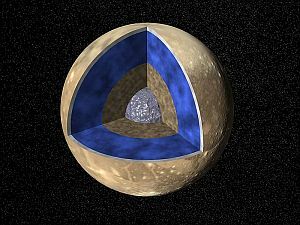 As the moon has a magnetic field, the polar areas are relatively unprotected areas, enabling these intense rays to cause redistribution of water molecules. 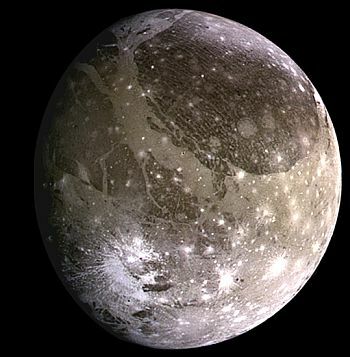 One theorised model of Ganymede's interior suggests a mantle divided into a warm ice area, with a silicate area beneath, culminating in a liquid core of iron sulphide and iron. A further speculation is that there may also be, right at the centre of the moon, a solid iron inner core. The liquidity of the core is the probable explanation for the generation of Ganymede's magnetic field. In 1995, the Hubble Space Telescope provided conclusive evidence of a tenuous atmosphere on Ganymede. Scanning in the far ultraviolet, it detected the presence of oxygen atoms. This atmosphere is thought to have formed when radiation bombardment from the solar wind separated the hydrogen and oxygen in the water molecules of the surface ice. The hydrogen atoms, being lighter, were lost into space. The moon may experience aurorae, much like Earth.